Sometimes when I go on a ministry trip, I can get tired. Even though I love what I am doing, the rigors of travel, different places to sleep, meeting new people, etc. can get very tiring. 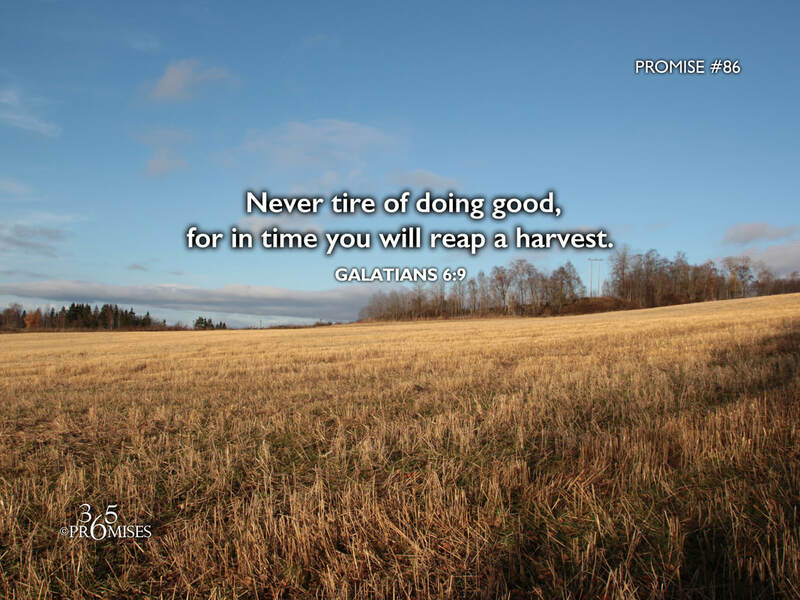 In today's promise we read that we should never tire of doing good. This doesn't mean that we never get tired in the natural, but it does mean that we should never lose heart and give up. In 1 Corinthians 13:13, Paul the Apostle tells us that faith, hope and love remain. Today's promise is about encouraging us to be strengthened with hope. Hope that there is a harvest that we will one day reap if we do not give up. God loves it when we do good to one another. May you and I have strength today to continue to do good to those around us and may we be encouraged to know that there is a real harvest that we will reap if we don't give up.